The Quatos adaptive controller is a closed source add on offered by Drone Controls. A valid license key is needed to use the Quatos adaptive control addon. All new AQ controllers (M4 or AQ6) sold from October, 30th 2014 will include a Quatos license for personal hobby use on crafts up to 1kg. Please understand that the Quatos license is a third party add-on, developed by a company and offered for commercial, educational or research purposes. All info about Quatos, Licensing and Upgrades can be found on the Drone Controls Website. Commercial or institutional use is not permitted under the personal hobby license. The hobby license is purely for recreational flying by hobby pilots. The give-away-for-free 1kg license and the licenses for personal use are meant for those who want to dive into the matter of adaptive attitude control. Quatos in general is not targetting the hobby market. Personal Hobby license for crafts up to 2.5kg is priced at 99 USD. If your hobby craft weighs more than 2.5Kg commercial rates apply. Commercial license for crafts up to 10kg is priced at 995 USD. Connect your AQ FC to QGC via USB or wirelessly. Use the “Config” tab, Open the “Communication Console” Tool Widget. Press “Restart” in the “On-board Parameters” tab on the left. The Communication Console will show messages for initializations and the serial number. 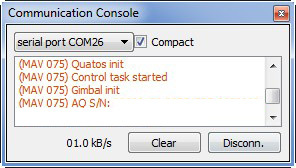 Your AQ Quatos License Key is bound to the AutoQuad Flight Controller. Every board has a unique serial number – you need to make a payment to sales@drone-controls.com via Paypal. You will receive your license key within 1 day. The license key will be used in the parameter LIC_KEY1 and will be uploaded to the craft along with the other Quatos parameters that will be generated. Lost your License key? No problem, you can retrieve it here. This page was created on 5-Aug-14 by kinderkram. Last modified on 4-Jan-15 by kinderkram.